Dr. Who, the BBC produced British sci-fi TV series, has produced hundreds of episodes since it first premiered in 1963 and it is fair to say there are fans that span across generations. To cater to the Whovians (as fans are known), wife and husband team, Alexandra and Kevan Looseley-Saul opened a shop and museum in East London in 1984 to showcase show memorabilia and props as well as offer toys and merchandise for sale to the public. The Who Shop offers pretty much everything and anything that is related to the multi-faced Time Lord that has been produced. In addition to the expected items for sale like t-shirts, mugs, keychains, pins and of course, DVDs from each season, the shop also has exclusive like signed autographs from the cast, such as Tom Baker, the fourth incarnation of the good Doctor in the original series run and David Tennant, one of the 21st-century versions playing the titular character. Additionally, ancillary memorabilia like an original script for the 5-part BBC audio series Doctor Who & "The Paradise of Death." that aired in 1986 and signed by the major cast is another possibility that treasure hunters can pick up. The shop isn't obsessed with only supplying cannon options—Dr. Who spin-off series Torchwood also has a section of gear for sale. You can only reach the museum from inside The Who Shop, but good luck spotting a museum sign or entry door as none exists. For visitors to gain entrance to the museum they need to go to the cash register and ask to buy a museum ticket; only then will all be revealed. 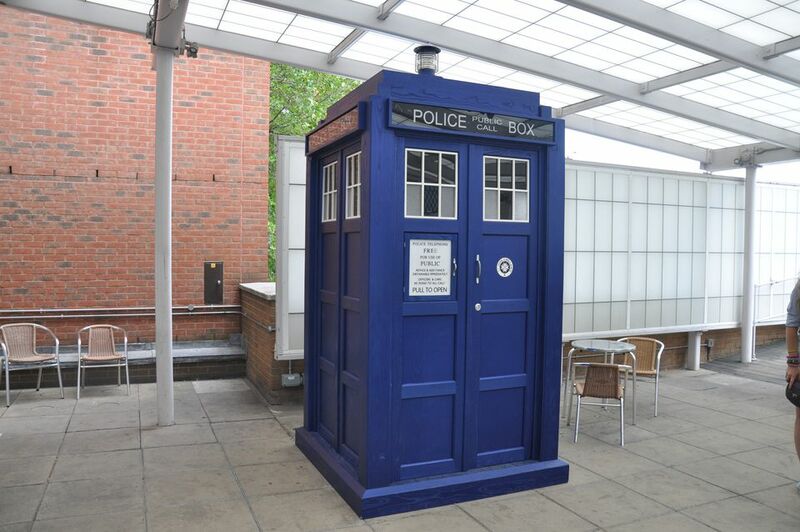 Once a ticket is in hand, the visitor is given a key and led over to a replica of the TARDIS. Insert the key into the telephone box door to start exploring the museum devoted to the world of Dr. Who. As one would hope and expect, it is bigger inside. The one-room museum is the width of the shop and has over 120 props and costumes on display and more are added regularly. Most are from the Doctor Who TV series but there are also artifacts from Torchwood, The Sarah Jane Adventures and K9 dating back to 1964. There are also some items from other TV shows such as Buffy the Vampire Slayer and Red Dwarf. Visitors are always accompanied by a guide, either one of the owners or a member of their expert team. One of the larger items on display is the Console from the 1989 Doctor Who Stage Play "The Ultimate Adventure" but there are also original scripts and other production paperwork on display. Some costumes and props are in glass cabinets but others are not. Photography is permitted and the staff is happy to lend a hand take photographs so fans can pose alongside the exhibits. A lot of the collection is from the older series of Doctor Who, so the museum will especially appeal to those who have been following the show for a long time. The hours of the shop and museum vary slightly, so confirm prior to heading out to avoid disappointment. While the shop is open Monday to Saturday 9:30 a.m. to 5:30 p.m, the museum portion hours on those same days are 10 a.m. to 5 p.m. The Shop and Museum can be found at 39-41 Barking Road, Upton Park, London E6 1PY. The direct telephone number is 020 8471 2356. Do note that Museum tickets are cash only. The nearest tube is Uptown Park. From the station, cross the road and turn right. Continue along Green Street past West Ham Football Stadium and at the pub on the corner turn left. This is Barking Road and the shop is by the bus stop.